When onions, ginger, garlic, chana dal, urad dal, dry red chillies and curry leaves are sautéed in oil and pureed in blender, a delicious onion chutney is born. 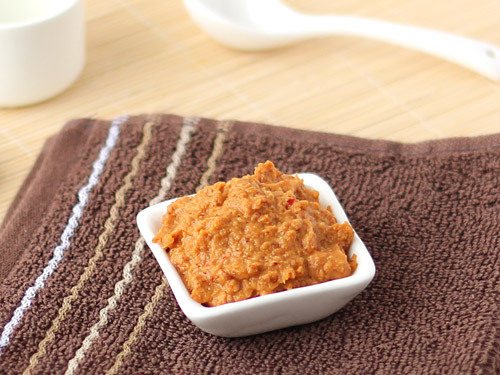 The tamarind paste and jaggery makes it simply irresistible as it provides sweet and tangy touch to spicy and aromatic flavor of ginger-garlic and curry leaves. The sautéed urad and chana dals makes it a typical south Indian fare and hence, it’s a perfect condiment to be served with idli and dosa. Heat 1 teaspoon oil in a pan over low flame. Add urad dal and chana dal and sauté until dals turn golden brown. Add dry red chillies and sauté for 20 seconds. Transfer them to a bowl. Heat remaining 2 teaspoons oil in same pan and sauté chopped onion, chopped garlic, curry leaves and chopped ginger until onion becomes light brown or for approx. 1-2 minutes. Remove pan from heat and allow mixture to cool. 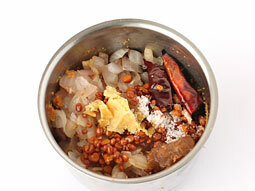 Transfer sautéed dal mixture and sautéed onion mixture to grinder jar or food processor. Add tamarind paste, jaggery and salt. 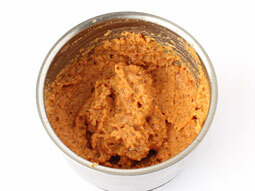 Transfer prepared south Indian onion chutney paste to serving bowl and serve you’re your favorite dosas and idlis. 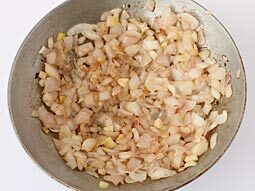 Sauté onion properly to get rid of its raw smell. 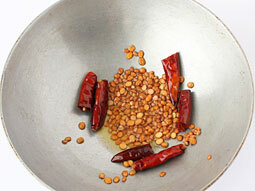 If dry red chilli is not available, then add 1/2 teaspoon red chilli powder in step 4 as a substitute of it. Use sesame oil instead of any other cooking oil for a nice flavor. 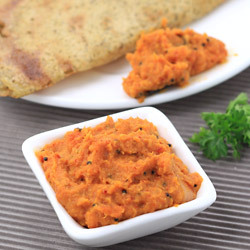 Serving Ideas: This Indian onion chutney for dosa and idli can also be served with steamed rice, chapati and your favorite curry as a yummy accompaniment. Thank u for sharing this recipe. what type of grinder are you using? Response: Indian style mixer grinder is used in all the recipes. You can find it easily online or in stores in India and online (preethi mixer grinder) on amazon.com outside India. Instead of jaggery what ingredient can be used? Response: You can use same amount of sugar instead of jaggery. Thanks for the quick and easy recipe. Tried it was and it was yummylicious. What is the shelf life of this chutney? Response: It stays good for 2-3 days in the refrigerator. Awesome recipe just now I instantly tried and the taste was good will try all ur recipe one by one. Hi, can we use something else instead of tamarind? Response: You can use lemon juice instead of tamarind. Superb taste. Thank you for such an easy recipe. Great work. Very helpful and easy learning. Thank you so much.